Well, it’s time to move. You’ve debated what to move and trashed, sold, or donated nearly every large item you own. We here at moveBuddha certainly applaud your minimalism. But, despite your purging efforts, you still have about 20-30 boxes of clothes, kitchen stuff and other miscellaneous items you can’t imagine trying to replace. To ship boxes is without a doubt easier than moving an entire house of furniture. But, figuring out the cheapest method to move 20-30 boxes long distance can still be tricky. Every move is different. The key to finding the best option is to compare all of them. Here we lay out every way we know to get boxes shipped. Oh, and if you want to save money on boxes either get them free or buy boxes online. Yes, Amtrak the train company is actually a great option if you only need to ship some boxes. Here are how it works and some quick tips when shipping with Amtrak. Discard any fragile items or electronics. Amtrak won’t let you ship those items. Package your items in boxes no larger than 3ft x 3ft x 3ft and no heavier than 50lbs per box. If you have larger or heavier boxes, you’ll need to call ahead of time to make sure they can handle them. Number each box and keep an idea on what is inside. It’s a good idea to put everything in sealable bags before putting it in the box. Put your Name, phone, and address somewhere inside the box. Weigh your boxes by first weighing yourself. Then stand on the scale with your box and subtract your weight. Make sure the boxes are under 50lbs each. Split up your boxes into groups of 500lbs. Amtrak only allows you to ship 500lbs worth of boxes per day, so if you have more you’ll need to spread out your shipments over multiple days. Wrap the box in packing tape. No, not just around the seams. Seriously, wrap the entire box in packing tape. Make sure to coordinate pickup of your boxes at the destination ahead of time. You get 2 days to pick up everything once it’s arrived. $40-$80 for the first 100lbs and then $.40 to $.80 for each additional pound over the first 100lbs. You’ll also need to factor in the cost of shuttling your boxes back and forth from the Amtrak terminal. Good and cheap option to ship clothes and durable items. If trains aren’t your thing, maybe try the bus. Greyhound offers package express, a way to take advantage of excess space underneath their buses. Here are how it works and some quick tips when shipping with Greyhound. Consider alternatives for electronics and breakables. While not explicitly banned, Greyhound probably isn’t a great option for shipping electronics or fragile items. Their insurance will exclude these items as well. Package everything in boxes or containers no larger than 30″x47″x82″ and no heavier than 100lbs. Everything needs to be able to fit under the bus. Weigh your boxes by first weighing yourself. Then stand on the scale with your box and subtract your weight. Make sure the boxes are under 100lbs each. After the boxes are inspected by Greyhound, wrap the entire box in packing tape. The more tape the better. For an extra fee, Greyhound offers to pick-up and deliver your packages door-to-door. Pricing tends to be roughly around $1 per lb with additional charges depending on the package’s size. Door-to-door delivery will increase your costs. Visit Ship Greyhound to get an online quote. Many people look to major carriers like UPS or FedEx first, only to be surprised at how quickly costs can add up when shipping boxes in bulk. Generally, the more boxes you’re trying to ship the less economical traditional parcel shipping services become. We certainly recommend getting prices on at least two of these companies to see where they line up. For those who have a lot of books they can’t part with, there is a cheap shipping hack with USPS. USPS media mail is a special type of mail classification allowing you to send media (books, DVDs, CDs, printed music) cheaply. If you’re shipping books long distance, there is no cheaper option than media mail. As long as the contents of your box meet the definition of “media” and your box is under 70lbs you’re good to go. Find out more about media mail here. Quote a few carriers to see what kind of pricing you can get. Since the big carriers offer higher insurance coverage and more careful handling, it may make sense to ship electronics and fragile or high-value items separately through these carriers. Use media mail when possible! UShip is a marketplace connecting trucking companies with people looking to ship things. Most people don’t realize the massive trucking industry ($700B in the US alone) is made up of thousands and thousands of independent haulers. And guess what, these truck drivers are more than willing to haul your boxes if they have some extra space on their rig. The tricky part is finding a driver already headed the route you want to go. That’s where UShip’s marketplace comes in. The way it works is you post your move on UShip’s move board. Truckers can view the requirements of the move and then bid on the job. The truck driver has a chance to make some extra money and you get a great price. The only drawback here is sometimes independent drivers aren’t the most professional. While UShip does provide reviews and a verified vendor system, you’re still ultimately responsible for picking a good vendor. Do your research! Certainly, doesn’t hurt to post your shipment requirements and see what kind of response you get. If you find a shipper with a proven track record and a decent price, UShip can be a great option for small moves. With checked bag fees going up and up, many people overlook airlines as a viable method for shipping. Most airlines are still pretty expensive when it comes to checked bags, but Southwest and Alaska Air are certainly worth a look. Southwest airlines offers decent bag rates with 9 bags running just about $525- roughly $60/bag. Alaska Air offers checked bags at $75 per bag.. If you don’t mind looking like a packrat in the airport, consider “the airline move”. For a complete breakdown on carry on rates check out this article from MapHappy. United and Delta also offer cargo shipping options. To be honest, we don’t have much experience with either one of these offerings and couldn’t find out too much about them. If you know more, let us know in the comments. Links below. While airlines won’t work for the majority of people, it’s still worth looking into. Update: ShipSmart, (866) 333-8018, will actually do all the work of prepping and shipping your goods via freight for you. Mention moveBuddha to get a 10% discount from ShipSmart. For those who don’t mind getting their hands dirty, freight shipping can be a very economical option. Put all the boxes on a wood pallet and shrink wrap the hell out of it. Make sure to shrink wrap around the actual pallet so everything stays anchored to it. Here’s a picture of what it should look like. Load the pallet up with boxes at a location where it can easily be brought out to the truck, i.e. your garage. Now you need to call around and get rates from freight companies. Here is a carrier list. Boxed, household goods are typically categorized as freight class 150. Haggle, haggle, haggle. Carriers are going to try and overcharge you. You should be able to get 1 pallet shipped for a few hundred bucks depending on the details. You’ll probably need a liftgate (small elevator on the back of the truck that will bring the pallet down to ground level) and a pallet jack to move the pallet. This will be a small additional charge. Make sure to let the shipper know you need these services. Freight can also be a good option if you’re just trying to ship a couch or single furniture item. If you don’t mind doing some prep work and haggling, freight can be a very affordable option. If you’re already planning on driving and your car meets the towing requirements, a cargo trailer can be a great way to transport small and even larger moves. UHaul is the only company we know of that rents trailers for long distance moves. If you’re really looking to save money, you can also buy a cargo trailer off a site like craigslist and then resell it at your destination. Keep in mind, tow-behind trailers are responsible for a lot of accidents and can be dangerous. Hence, why so few companies rent them. If you don’t have experience hitching and driving with a trailer, we wouldn’t recommend learning on a long distance moving adventure. Trailer sauce has some excellent tips for trailer towing. For those with the right car and experience driving with trailers, this option is going to be hard to beat. 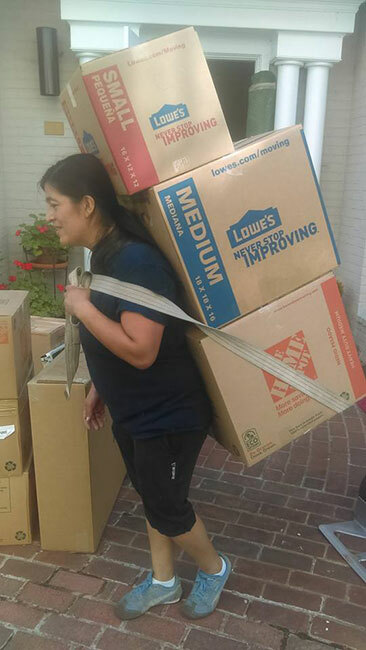 We often get asked if a moving company will just toss a few extra boxes onto their truck. While this seems like it would be a win-win for both parties, when you add up all the costs associated with moving, these arrangements rarely make financial sense for a moving company. That’s why many moving companies have minimum size requirements on long distance moves. During the busy summer moving season, companies typically raise their minimums to 3000 lbs. If your move is closer to 1000lbs then it might be a good idea to check out our moving cost calculator to compare moving companies to other options for larger shipments. There is a slight chance you may be able to find a mover who will do you a favor, but more than likely moving companies are not a good option for shipping a couple dozen boxes long distance. If you want to check moving company prices check out our list of the best reviewed long distance movers. Have another idea? Let us know in the comments.